What does God challenge me to do, be, or change - with regards to 2 Corinthians 13:11-13? These were the questions at the Bible study portion of our weekly staff meeting this morning. These are two of the lessons for this Sunday, June 15th, 2014, Trinity Sunday. It goes right along with what I was writing last night about creating a space for daily prayer and reflection. In reading these lessons and pondering about the simple, yet confusing concept and nature of the Trinity....well, WOW, there's a lot to ponder. The Christian faith is resolutely Trinitarian and regardless of how I individually might struggle with this concept, the community fills in those faith gaps. While I dare not to make an heretical analogies just yet (see the veeeery end of this post for some of St. Patrick's Bad Analogies), I decided that our standard for the nature of the Holy Trinity as community is one aspect of our human struggle to remember by the actions of the second verse of 2 Corinthians: "Put things in order, listen to my appeal, agree with one another, live in peace; and the God of love and peace will be with you" --- to actually receive the last verse of 2 Corinthians: "The grace of the Lord Jesus Christ, the love of God, and the communion of the Holy Spirit be with all of you". When it comes to that daily prayer........Do we sit down and reserve and spend some time for God in my daily life and activities? Do we forget? Do we see it as a reflex, a habit, a necessity, a gift, or what? What do we do with this thing called prayer? I can tell you without reservation that for different portions of my life, I tended to save prayer for right before I went to sleep. I had the idea that it was supposed to be a private affair and quiet and....well, that made it rather stagnant. What would happen? I'd fall asleep OF COURSE! Was that a bad thing? Probably not dire, but I felt badly about it. It's not too cool to feel you are failing at faith and prayer. It was also indicative that I was definitely not giving God enough space in my being. Throughout my life, my ideas of prayer have certainly evolved and largely in part to my living into the greater Church, into The Episcopal Church, and witnessing how others dealt with faith and how they prayed. I came to realize that doubt is part of faith, and sometimes failures can be the "roads less traveled by" that can lead to triumphs in disguise. Prayer is a necessity, a reflex at times, and a gift. I strive to live and focus on realizing and recognizing that our whole lives ARE ministries and many times, our actions can show our faith. These are easy things to forget and I was recently reminded by our bishop of this fact that our whole lives are ministries - it was wonderful to hear again. I believe that God is infinite and therefore space is as well. I believe that within us lies infinite potential and wonder. I feel that connecting these elements is as necessary as breathing. Are daily prayer and reflection a part of my life? I'm excited to say that right now, they are! loads of time (cue laughter) on my hands :-) I'm kidding. Seriously though, I am finding that daily prayer can take many forms: meditation, prayer, scriptural reading and mulling over it, breathing in the spirit of being still and knowing that God's presence (nature, walking in City Park, etc.) and basically acting out or being prayer. I consider that nature photography can be a form of prayer. It is sharing time with God and acknowledging his presence in our lives that gives us wholeness. I've known these things for years, but perhaps it is where I am in life right now that allows me to live it rather than to simply see or say it. One of my favorite things to say when I wake up is: How can I be more loving today? Another is: What can I do for you today, God? It gets me thinking about my actions and motives. Two years ago, I found myself wanting to combine aspects of my life.....perhaps those that seemed unlikely partners. One such combo ended up being what I call "Coffee with God". Sound silly? That's ok, it does to me too sometimes and it makes me laugh and I'm ok with that. It came about because of my coffee habit. I am pretty much addicted to coffee and tea and Snapple Mango Madness. Just ask me about my Starbucks mocha frappuccino habit. No, I'm lying, don't ask me. Just buy me one. I like and am addicted to the crackfish at Lakeview Grocery too, but that's another post, literally. So the "Coffee with God" was a way for me to make a good thing out of a questionable thing. 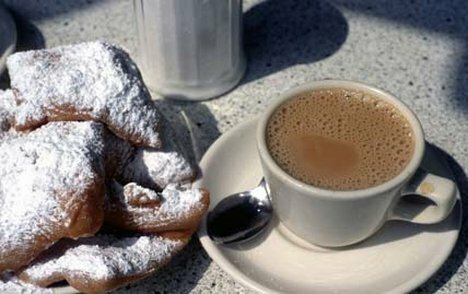 I bought my coffee or Snapple and came into the St. Paul's NOLA sanctuary and sat and spent time with God in meditation, prayer, and sharing my hopes and dreams and it helped open me up beyond belief! Who knew?! God knew. One thing I completely love doing is spending time online. Yes, I admit, I am an online junkie of sorts. It's not so bad until I realize I've been leaning over a computer and that hours have passed. For the past two years, I have made concerted efforts to subdue this habit of mine and while I still spend plenty of time online and on social media, I have indeed learned to give these things their times and places. I've learned to cut my phone off (and I'm from South Carolina so "cut off" is normal speak :-) With the time that I allow myself, during the past twelve months, I decided to see if I could focus some of my online efforts and mix them with productivity. Why don't I include some prayerful blog posts?! It was a PERFECT match for me and the idea of accountability in prayer. For sure, this is one of my attempts at daily prayer and meditation and as we struggle to find time in our over-filled and joyfully busy lives, why not take some time to share what we love doing and OPENLY INCLUDE GOD. Yes indeed! With this, there will always be more to do and new ideas, continuous growth and deep reflection! 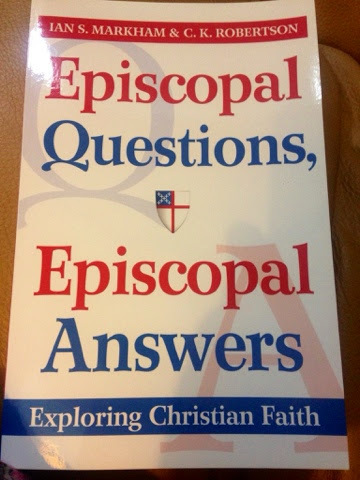 So, my current blog, CARSONIA continued and Episcopal Space was born! 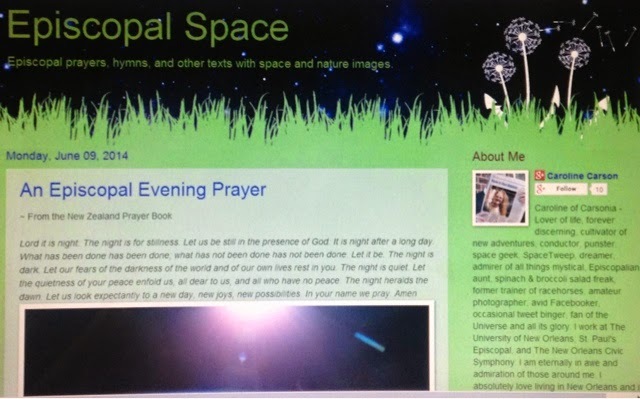 (Check them out if you have time..... #shamelessplug ) I love space, I love Episcopal prayers, I love blogging, and VOILA! Seeing images of our solar system, the universe, and what lies beyond our realm of influence amazes me. It overwhelms me. With all of the science background I have and all that I have read and heard from scientists and astrophysicists, it simply reinforces for me that it is all divinely created. I decided to include a daily post of a space image with an Episcopal prayer, a hymn text, a psalm verse or another text! I am hoping to keep it up for my own daily meditation and reflection. I also see space as Trinitarian. The Universe is about 13.82 billion years old (Big Bang Theory) so that is the distant past. We exist now. Someone else sees our star's light or receives our radio signal in the future and for them, it will be the present and yet is will be our past. It's just SO. INSANELY. COOL. Sometimes I truly struggle to get every little thing done, but what's it all for if we don't allow and ensure that God is in and influencing our lives, our thoughts, our feelings, our very spaces? And so I close this rambling mixed bag of a post with wishing you luck on your faith journey wherever you may be. Wish me luck with continued prayer and reflections! I charge you to think about your daily prayer and how you can include God and prayer in various aspects of your life that you may have previously thought impossible or perhaps have yet to consider - and to do this between Sundays! While you're at it, some of the images and experiences in the blogs mentioned above may help you or inspire you! Think about how we experience the divine in our daily lives, how we strive to grow spiritually in communion with one another and the saints. We hopefully won't get to a point where we feel we have "arrived" as prayer isn't something to simply check off on a list, but hopefully we may continuously grow spiritually throughout our lives and in all aspects of our lives.